We’re constantly told what to do to avoid using our cell phone while driving. Television advertisements and highway safety notices detail the dangers that a quick glance at your cell phone can bring on the road. But what about other distractions? 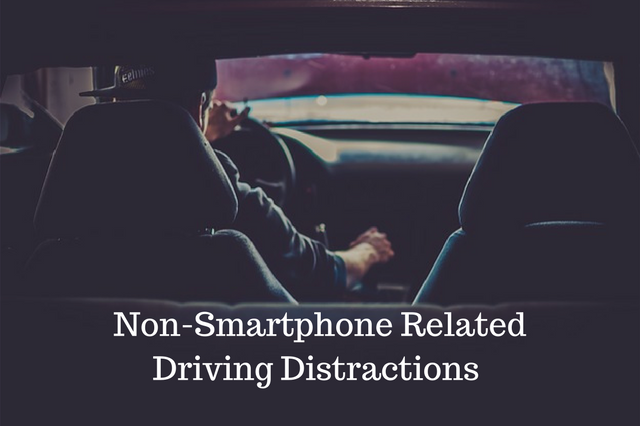 Let’s examine several common driving distractions that aren’t related to your smartphone, and how you can avoid them. It takes just a small splash from opening a can of soda, or a whiff of a cheeseburger with fries for a driver to become distracted on the road. This is why it’s important that your passengers know if it is okay to eat or drink in your car. If it is okay, make sure they are trying their best not to distract from your driving. If it isn’t okay to eat or drink in the car, give your passengers a chance to eat their food while parked. Lastly, make sure that any snacks or drinks are in strong containers so that they won’t spill in the vehicle. In addition to your smartphone, there are a number of devices within the vehicle that could distract you on the road. One of the most common forms of distracted driving is when drivers focus too strictly on their GPS system. To combat this issue, driving apps like Waze cannot be used by drivers in motion. Tinkering with your GPS while driving is highly likely to lead an accident. You might not like the current song the radio is playing but reaching down to alter the station while on the highway can be highly dangerous. The same goes for changing the track on your CD or any other audio source. Make sure you pay close attention to the road and your vehicle and only reach to change the station when you’re in a familiar area driving at a comfortable speed, or stopped altogether. It is up to the parents to explain the rules of the car to child passengers. Children should have a clear understanding what to do and what not to do. They should know not to throw toys or yell out while someone is driving. They should also know how to get their parents attention when they do have an issue. Creating these rules can help ensure that you don’t have to focus too closely on events taking place in the backseat rather than the road in front of you. Driving in unfamiliar areas may cause you to turn your head around to try to find landmarks and street signs to help you find your way. When you’re lost or in unfamiliar areas, stop the vehicle, put it in park, and find a route with the help of your smartphone, map, or GPS device. Make sure you have a route in mind rather than trying to make up your directions as you drive. By limiting these distractions and harnessing the guidance in this post, you can ensure you achieve optimal driving safety on the road. To learn more, speak with our team today, or sign up for a driving course. Check out here tips and advices for parallel parking!